IT engineers use generic propriety models when designing networks. As television moves towards IP, broadcast engineers must understand these networks and how they work. This series of articles explains networks from a broadcast engineers point of view so they can communicate with IT engineers to get the network they need. Network timing needs, differing working practices and protocols, and data integrity all help to deteriorate communication between broadcast and IT engineers. Timing in broadcast is tightly defined and a thorough understanding of legacy television systems is required. IT engineers use asynchronous full duplex systems, expect there to be network failure, and use protocols that slow transmission to make sure data has been accurately delivered. Broadcasters use synchronous one direction connectivity and assume the network is as robust and as reliable as SDI. In this series of articles, we look at networks from a broadcast engineer’s point of view, giving a better understanding of core IT concepts and enabling them to communicate with colleagues in the “IT department”. To fully understand IT networks we have to understand the problem we are trying to solve; a network is needed to allow users to reliably and securely exchange data, and provide control of one computer over another. This is true of PC’s, servers, IP-camera’s, vision mixers and control panels, and the more secure and reliable a system, the more complex it becomes. A network has to be resilient, fast and reliable to give the best user experience. To explain the roles of routers and switches we start with a basic network of four PC’s and two servers connected together in a simple IP over Ethernet network using CAT5. Ethernet has three forms of physical interface; coaxial, twisted pair and fibre optic. They all send the same type of packets of data, but differ as twisted pair can send and receive data at the same time, but coaxial and fibre optic cannot. Transmission speeds are faster on fibre optic and coaxial. Few computers use coaxial connectivity as twisted pair is cheaper and more robust. Fibre optic tends to be reserved for high bandwidth switch and router connection due to its higher cost and fragility. Diagram showing simple hub network with congestion and security problems. Click to enlarge. A hub with twisted pair infrastructure (CAT5) could be used in a simple network. The hub is similar to a distribution amplifier allowing mapping of one-to-many transmit and receive pairs. The hub has no intelligence and will route a packet received on one port directly to all its other ports. 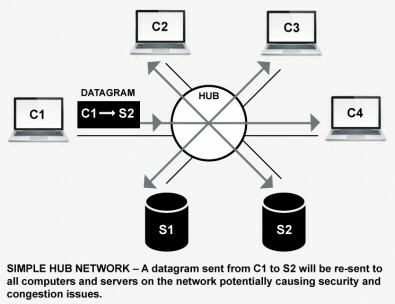 In a hub network, security becomes a problem as all users would be able to see data being exchanged between each other’s computers and servers. For example, all users would receive transactions associated with the finance server. Computer network cards receive all datagrams on the connected network and will usually discard those not intended for them. With the right software it’s easy to decode the datagram and view restricted and sensitive financial transactions. This is true of all of the systems running on any of the servers. Lost packets of data occur as network traffic increases and the physical connections become quickly saturated. 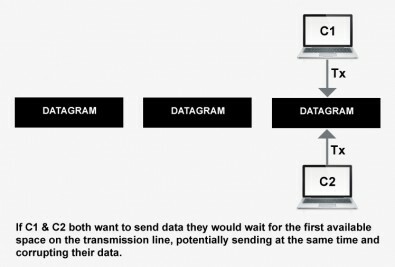 Network cards will detect collisions of transmitted datagrams so they can be resent. Ethernet is a packet switched system, each PC will monitor the transmit line and wait for a gap so it can send its own packet. Although the packets are of a fixed size, the frequency with which they are sent is random across all of the connected computers on the network. Another computer may be listening at the same time waiting for the same space, and two or more computers could try and simultaneously access the transmit pair resulting in a collision and packet loss, and slow response for the user. A network router or switch will protect against collisions and congestion, and is one of the reasons routers and switches are used, the others are to provide resilience and security. Switchers route packets at the Ethernet packet level (layer 2) and routers at the Internet Protocol level (layer 3). Diagram showing how two computers can simultaneously access the transmission line causing collisions and slowing down the network. Click to enlarge. In the ISO seven-layer model IP datagrams are encapsulated by the layer 2 Ethernet packets. This might seem like an unnecessary overhead, however, the IP protocol becomes independent of the transmission network and abstracts the data away from the hardware limitations of Ethernet. It’s entirely possible, during the lifetime of an IP datagram, that it will be routed over non-Ethernet networks such as ATM (asynchronous transfer mode) or RS-485. With IP we do not have to be concerned with the medium the data is travelling on. Each Ethernet card in a PC or IP-camera has its own unique hard coded address called the media access control (MAC address). Each camera can be configured to have a unique IP address, so a faulty camera can be replaced with the same IP address. The MAC address will have changed but the address resolution protocol (ARP) in the routers would detect this and reconfigure themselves without intervention from the network administrator. Managed Ethernet switches provide a better solution but have limited capability. The switch is configured with the MAC address of each computer connected to its ports, and will route traffic only intended for the associated computer reducing network traffic on each connection. For these reasons Ethernet switches tend to be used in fixed high speed applications such as core network switches. They are faster as there is less information to process in the Ethernet datagram header compared to an IP header. For example, there is no “time to live” value to be updated. Diagram showing switch and router to reduce network congestion and improve security. Click to enlarge. IP addressing schemes offer greater flexibility and allow administrators to specify their own IP number schemes. Security is improved as routers can be configured to make sure finance transactions only go to authorised computers and IP-camera’s only send their pictures to monitors and vision mixers in the studio. Programs such as Ping can be blocked to stop hackers detecting computers or even vision mixers and attacking them. Automatic routing algorithms provide resilience by detecting a broken link and sending the data via a different route. Multi-path links can be used between studio’s and outside broadcast consisting of different types of medium such as fibre optic and satellite, and users are unaware that routers have switched to a different path when a link breaks. Even in a simple network routers and switches improve network speeds and security, and routers become essential when resilience is needed. In part 2 we will be looking at resilience and security in more detail.